You’re tired of using Instagram or you don’t want to spend more time anymore. When you want to close your Instagram account, you must decide whether to close it permanently or temporarily. Because if you do not know how to close Instagram account, you may not be able to undo the wrong transaction. Pay attention to this when making your choice. Because you can close in 2 different ways: permanent or temporary. If you delete it permanently, all your data will be deleted and you will not be able to retrieve it. If you delete it temporarily, you can reactivate your account within 30 days. Please note that you cannot delete your Instagram account from the app! You can only do this from Instagram official website. You cannot close an account from Android or IOS applications. Well, if you are sure to delete your account, we will explain you both way. But before that, don’t forget to back up your data. To perform the backup process, enter the Settings tab. Click Download data link from Privacy and security. Type your email address and request a download link from Instagram. If you want to temporarily suspend using Instagram, you can close your account at this link. 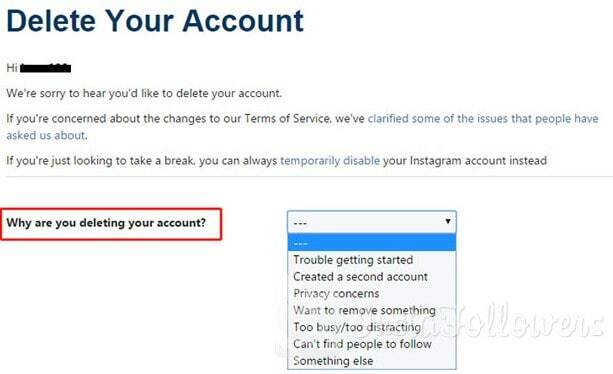 Instagram will ask you a few brief questions and will want to learn why you want to temporarily close your account. Specifying a valid reason is mandatory for the security of your membership. Select one of the ready answers, enter your Instagram password and start the temporary close process. After that, you can only re-activate your account. During this time, your account cannot be viewed by anyone and your content will be hidden. You should think carefully before doing this. Because it’s a very sensitive procedure. Note that you can undo it. If you are sure to do this, you can do it here. Instagram will ask you to provide a valid reason. You can select one of the options and proceed to the second step of closing the account. Instagram will give you some options to give up this decision. If you are still determined to close Instagram account permanently, you can type in your password and close your account. After that process, you can’t take the same user name again, if you want to sign up for an Instagram account again. If you permanently close Instagram account, you cannot register the same username again. If you have temporarily closed the account, you can reopen it at any time and your data is protected. Note that in both cases your friends will not be able find you on Instagram. When you decide to close your account, share this idea with your friends.